Nissan is looking to triple the size of the electric car fast charging infrastructure in the U.S. The plan is to deploy at least 500 fast charging stations across the U.S. over the next eighteen months. The announcement came on Wednesday at the Washington DC Auto Show, and part of the plan is to build the first fast-charge network in the Washington DC area in partnership with NRG's eVgo subsidiary. Nissan estimates the U.S. currently has about 160 fast charging stations, none of which are in the Washington DC area. They note that most people are relying on home charging using level 2 charging stations. Fast charging on a Nissan Leaf does an 80 percent recharge in about 30 minutes. Fast charging is more useful for charging in public than is level 2 charging, because of the relative time requirements. Deploying at least 500 fast charging stations will, by itself, triple the current fast charging infrastructure. Nissan's three-pronged strategy for increasing fast charging network infrastructure works through Nissan dealerships, workplace charging, and a third venue Nissan describes as "opportunities within local neighborhoods that help interconnect communities where drivers spend the bulk of their time and do the majority of their driving." Nissan's partners include the Nissan dealerships, municipalities, and infrastructure partners that include NRG Energy's eVgo network. 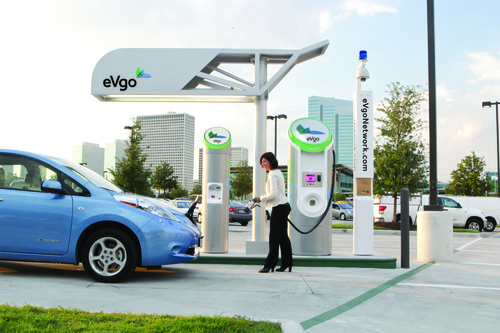 However, eVgo is only one of Nissan's charging infrastructure partners. NRG's eVgo network is expanding into the Washington DC area, and that ecosystem will include 40 eVgo Freedom Station. Each Freedom Station site will have a Nissan fast charger. 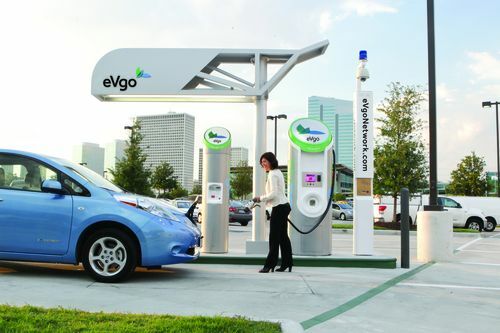 This will be the first fast charging network in the Northeastern U.S. NRG's eVgo network is currently operational in Houston and the Dallas/Fort Worth Metroplex, and is in the process of launching the eVgo service in California. "NRG's new ecosystem in the greater Washington, D.C. area will provide range confidence and convenience to EV drivers," said Glen Stancil, vice president at eVgo. "Nissan's fast chargers are a critical element of the overall ecosystem, which will also include charging solutions for single-family homes, multi-family communities and workplaces. This eVgo ecosystem will enable drivers in our nation's capital to confidently enjoy the benefits of electric vehicle ownership." That means Nissan's plan of over 500 total fast charging stations allocates 40 to the Washington DC area. Where are the rest going? Two weeks ago Tim Gallagher, Nissans Western US Manager of Corporate Communications, mentioned a plan to build a dealership-based network of fast charging stations. What he described was a network solely within California that would have "great coverage throughout the state" that he described as "sort of a test program for us, because we want to see about usage." Gallagher's boss, Travis Parman, confirmed that network in California is part of this larger network of 500 charging stations. He described the deployment at California Nissan dealerships as a pilot project "with about 30 dealers in California to determine best practices for leveraging dealerships in the fast charge network." In addition to growing the network of public fast charging stations, Nissan is looking to increase availability at workplaces. Workplace charging is growing and offers what Nissan calls end-to-end charging, or others have called "destination charging". It effectively doubles the range of an electric car because the car owner can leave both their home and workplace with a fully charged car. Because Nissan's electric car has a CHAdeMO compatible fast charging port, the fast charging stations in this network will of course be CHAdeMO compatible. There was a standards battle in effect for several years between CHAdeMO and SAE's DC Fast Charging system. But in October 2012 the SAE J1772 committee approved the SAE DC Fast Charge system as the standard. While there are no electric cars available to the public which implement this standard, the Chevy Spark EV is due to go on sale later this year and will come with an SAE DC Fast Charge port. Nissan is undeterred by the existence of two DC Fast Charging standards, and is continuing to push for CHAdeMO adoption. In the short term a move like this will act to make the Nissan Leaf more popular, by adding value to the Nissan Leaf. The two fast charging systems are kind of like the VHS-versus-Betamax debate from the 80's, and of course both lost out to DVD and BluRay in the end.